Named after Frederich William, the "Great Elector" (Grosser Kurfurst) who ruled Brandenberg from 1640-1688. She was launched December 2, 1899 as Grosser Kurfurst and was completed April 26 1900. Her maiden voyage was on the Bremerhaven - New York route on May 5, 1900 and her first voyage was Bremerhaven - Australia November 7, 1900. Engaged in alternate service from Bremen to New York and Central America and from Bremen to Southampton, Suez Canal, Albany, Adelaide, Melbourne and Sydney. The Australia voyages ended in January 1912. On October 9, 1913 the British steamship Volturno of the Royal Line, caught fire in mid-Atlantic with 600 emigrants on board and sent out a distress call. The Grosser Kurfurst and eight other ships steamed to the rescue. The other vessels included the Seydlitz of NGL, the Carmania of Cunard Line, Kroonland of the Red Star Line, Minneapolis Atlantic Transport line, La Touraine of CGT, the Russian Czar and the British tanker Narragansett. 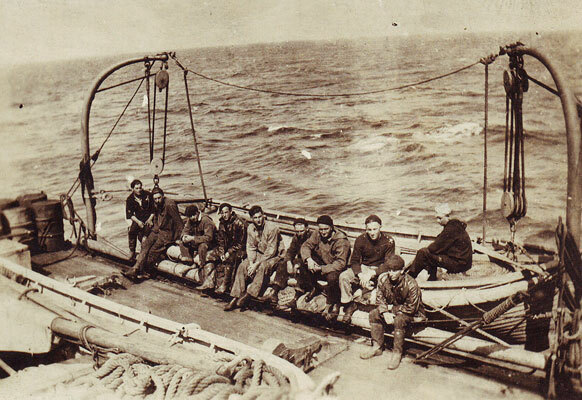 The following morning, after the tanker Narragansett had calmed the sea by pumping out oil, 521 survivors were rescued and another 105 taken aboard Grosser Kurfurst. When World War I broke out in Europe, Grosser Kurfurst boasted that she had "enormous carrying capacity" and "excellent passenger accommodation" for all classes from first to steerage. She was forced to seek shelter in New York in August of 1914. The United States Government interned these German ships wherever they had put into port, and upon the entrance of the United States into the hostilities on the side of the Allied and Associated Powers, on 6 April 1917, took them over for "safe keeping". Customs agents boarded the Grosser Kurfurst in the port of New York, along with 30 other German and Austro-Hungarian vessels, and sent their crews to an internment camp on Ellis Island. However, before these sailors left their ships, they carried out a program of systematic destruction calculated to take the longest possible time to repair. The Navy inspected the Grosser Kurfurst and designated her the "Id. No. 3005" and earmarked her for service with the Cruiser and Transport Force to carry troops to France. She was commissioned into the US Navy as USS Grosser Kurfurst on 4 August 1917, at the New York Navy Yard, Comdr. Clarence S. Kempff in command. While the ship was undergoing the repairs and alterations necessitated by the German sabotage and in light of her expected role carrying troops across the Atlantic, General Order No. 320 of 1 September 1917 changed her name to USS Aeolus. Her armaments during her war years were four, 5-inch deck guns, 2 Colt machine guns, 1 Lewis machine gun, and 9 "depth mines". On 26 November 1917 the erstwhile luxury steamship now wearing war paint, departed the Port of Embarkation at Hoboken, N.J., bound for Europe on the first of eight round-trip voyages during World War I, carrying troops to the Old World. She reached St. Nazaire, France, on 10 December and spent Christmas in that French port before she headed home on the 28th bringing the voyage to a close when mooring at Newport News Va., January 9, 1918. Shifting thence to Hoboken Aeolus again sailed to France and returned from Brest again to Hoboken. During the great expansion in the strength of naval personel during the war many of the top notch enlisted men were selected for duty as an officer. Once such enlisted sailor was Byron Weston. He had enlisted into the Naval Reserve force on April 22, 1917 as a Seaman First Class. By Spetember 1, 1917 he had been promoted to Quartermaster Third Class. Weston was seen as someone who had the ability to lead men and he was selected to become an officer. On December 22, 1917 he accepted his commission as an Ensign aboard the Aeolus serving as a Junior Watch Officer and Division Officer. Ensign Byron Weston was Honorably Discharged on January 8, 1919. On March 14, 1918 the Aeolus has a full load of Army troops aboard, and among the 66 officers and 1,364 enlisted men of the 15th Cavalry was a young trooper by the name of Earl S. Oskins of Spencer County, Indiana. Oskins was a member of Troop H and during the voyage aboard the Aeolus on the 6th day out, Trooper Oskins died from a condition known as Dilated Cardiomyopathy. On the return trip his body was brought back to the States and was burried in the Garden of Memory Cemetery in Gentryville, Indiana. Then in May another death occoured aboard the ship. This time is was one of her crew, Mess Attendant Third Class Juan Monet Fernandz, who passed away on May 18, 1918 from Lobar Pneumonia. 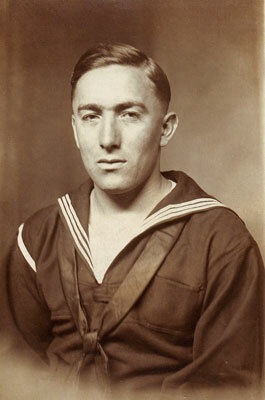 Fernandz had enlisted into the Navy on October 10, 1917 at the New York Navy Yard. His next of kin was his father Juan Fernandz of Culebra, Puerto Rico. Two events highlighted the ship's wartime convoy experiences. The first occurred during the beginning of what was to be the ship's third voyage to France. 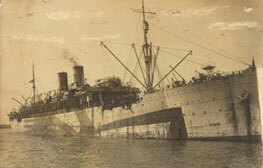 Aeolus, in convoy, departed Hoboken on 23 April 1918. Two days out, a steering gear casualty in the transport Siboney (Id. No. 2999) forced that ship to leave her assigned place in the formation. Aeolus, to avoid collision with Siboney, altered course radically, and in so doing struck the transport Huron (Id. No. 1408) at about 2100 hours, 25 April. Fortunately, no lives were lost, but both transports were damaged which necessitated their turning back. Aeolus reached Hoboken on 28 April. The second event occurred on 1 August 1918, while the ship was returning to the United States from Brest. At 0605, lookouts spotted what looked to be the wake of a submarine periscope some 6,000 yards distant. Changing course, Aeolus stood to general quarters and within a minute of the sighting, her number one and three guns commenced firing. For the next few minutes her gunners fired at the diminishing target until it pulled out of range at 0615. In the second week of October 1918 a message is received aboard the Aeolus for Hero Pohl, one of her crew. The message was to inform Hero that his brother Fireman 2c Julius Pohl, who was also serving in the navy aboard the USS Penobscot, had drowned on October 5, 1918. The Penobscot (SP–982), was a 121-foot-long harbor tug, that was built as Luckenbach No. 5 by Risdon Iron Works, San Francisco, California, in 1904. Under the name Dauntless she operated on the Pacific Ocean Coast until 1916, then moved to the Atlantic Ocean seaboard. The tug was acquired by the U.S. Navy from the Luckenbach Steamship Company and placed in service on August 29, 1917 as Penobscot SP-982. Throughout World War I she served as a section patrol craft in the 5th Naval District, operating out of Hampton Roads, Virginia, and the Elizabeth River. and in Italian waters during the remainder of World War I. The Penobscot was working off of Villa Franca, Italy, on October 5, 1918 when she suffered a fire that took the life of Fireman 2c Julius Pohl, USNRF, who was drowned during the fire. While the signing of the armistice of 11 November 1918 signaled the end of hostilities an occasion that found the ship en route from St. Nazaire to Newport News, Va., it only meant the beginning of the task of returning American troops from "over there." During the war Aeolus had transported 24,770 men to the European battlefront in her eight voyages. In the postwar months, Aeolus conducted a further seven turn-around voyages, bringing back some 22,080 healthy veterans, and some 5,018 wounded and sick. Commencing her last voyage from Brest on 26 August 1919, Aeolus reached New York City on 5 September and was immediately detached from the Cruiser and Transport Force. Decommissioned at Newport News on 22 September, 1919 and turned over to the United States Shipping Board Aeolus was presumably struck simultaneously from the Navy list. 26 February 1919, West bound 75th Artillery, C.A.C. ? ? Early in 1920, the Shipping Board let what one contemporary marine engineering journal called "one of the most extensive ship repair contracts ever awarded" in the history of the United States, to the Baltimore Dry Dock and Ship Building Co., of Baltimore, Md., to renovate the ship. Over the next few months Aeolus underwent massive alterations at a cost of nearly $3,000,000. Remodeled quarters, an extensive refrigeration system to preserve cargoes of frozen meats as well as the food to be consumed during the voyage, and the conversion of the ship from coal to oil fuel, all helped to make Aeolus one of the best-equipped liners afloat. On September 10 1920, four men were killed in an explosion in the engine room. Resplendent in her new livery a battle gray hull with a white superstructure Aeolus departed Baltimore on 20 November 1920 and proceeded to New York City where, shortly thereafter, she was turned over to her operators, the Munson Steamship Company. Aeolus sailed under the Munson Line's house flag, carrying passengers and freight to and from South American ports until the summer of 1922. Aeolus rammed and sank the British freighter Zero in South Atlantic, March of 1922 and took her crew aboard. In August of that year, she came under the flag of the Los Angeles Steamship Co. and was renamed City of Los Angeles. In September 1923 despite her age she was fitted-out by the Bethlehem Shipbuilding Corporation, Quincy, as a luxury liner for 446 First class passengers. New turbines produced 11,000 SHP; 17 knots, remeasured at 12,642 gross Tons. After being thoroughly reconditioned for her new operators, the liner sailed on 11 September 1922 for her maiden voyage under her new name, bound for Honolulu, Hawaii, in a new dazzling white paint scheme. By June 1924 she was back on the Los Angeles - Hawaii service, where she proved to be a popular ship, carrying Hollywood Stars and Business leaders. Along with her fleet mate Calawaii she sailed her regular service to and from the Hawaiian islands. In early 1931, the handsome liner figured in an experimental shore-to-ship airmail flight. A Ford tri-motor flying from the Grand Central Air Terminal at Glendale, California followed City of Los Angeles out to sea and, off the California coast, dropped a bag containing 12,527 envelopes onto the passenger liner's deck. The March 1931 issue of the Merchant Marine Bulletin speculated that this was probably the largest single consignment of airmail ever to pass through the Honolulu Post Office. LASSCO (Los Angeles Steam Ship Company) laid her up in 1932 due to world economic conditions. In 1933 Matson Line of San Francisco bought LASSCO and after a few voyages for her new owners, the City of Los Angeles was laid up in San Diego. In February 1937 loaded with scrap metal, City of Los Angeles sailed to Japan to be broken up. If you have a family member or know of someone who served on this ship please contact me and I will add a story about them her with thier shipmates. Stanley was the 10th of 11 children born to Francis "Frank" Marion Scott and Martha Jane Payne. He was born on Mar. 19, 1890 in Weir, Kansas when his parents settled there to farm, when this area was still the Indian Territory. When his older brothers reached the age of about 12, they would either run away from home or simply left to live with relatives. They all worked in the coalmines of the area. By June of 1900, Stanley, age 10, was the only one living at home with his parents on the farm in Cherokee Township, Kansas. His youngest brother had died as a child. Stanley worked on the farm with his father. In 1901 they moved to the Chickasaw Nation, Indian Territory (now Oklahoma) to homestead. Stanley later returned to Kansas to work in the coalmines. On June 5, 1917 Stanley registered for the Draft and at the time was living in Arcadia, Kansas where he worked for the Doubleday Coal Company. On his draft card under the section of claiming exemptions Stanley wrote; Ò Yes, Opposed to war.Ó And under the section of Physical appearance he was of medium build with brown eyes and light brown hair. He also listed that he had had his knee thrown out of joint. But these objections to war and his knee did not stop him from being exempt from military service. And so Stanley enlisted in the Navy during World War I when he was 27 years old. He enlisted at the U.S. Navy Recruiting Station in St. Louis, Missouri on June 19, 1917 as an apprentice seaman. His pay at date of enlistment was $16/month + $1.60/month. He was sent to the Naval Training facility at Newport, Rhode Island where he became a Seaman Second Class there on Oct. 27, 1917. He trained on the Receiving Ship at Boston for a month and then on the Receiving Ship at New York for a month. He is first recorded on the U.S.S. Aeolus on March 31, 1918 and served the rest of his time in the Navy on the Aeolus, where his S2C proficiency rating was a 3.5. Stanley became a Seaman on April 1, 1918 with a proficiency rating was then 3.7. And on January 1, 1919 became a Coxswain where his proficiency rating then ranged from 3.0-3.8. These Naval Professional Qualifications were based on proficiency rating, seamanship, ordnance, signaling, and ability as leader of men, sobriety, and obedience. Stanley's record's were signed by the following commanding officers: E.S. Bisset (at St. Louis), R.Z. Johnson, W.A. Edgar, A.C. Hodgson, C.S. Kempff, H.G.S. Wallace, and C.C. Moses. He was last on board the Aeolus on Sept. 20, 1919 and left the Navy at the Naval Demobilization Station in St. Louis, Missouri on Sept. 22, 1919 with an honorable discharge. His pay was $41/month at the time of his discharge. After the Navy, he returned to coal mining (digging and dynamiting) in Kentucky and in the Weir, Kansas area. When his parents became ill, he returned to Hastings, Oklahoma to care for them on their farm. Here he met and married his wife, Opal Hooper. After the deaths of his parents, he inherited this farm and worked for the WPA and drove a school bus during the Depression. He sold the farm in Oklahoma and traveled with his family (total of 9 people) in a Model A Ford and a 2-wheel trailer to California. With his savings of $500, he bought some land in the Lamont area and built his house where he was in the irrigation business there. Stanley died on July 7, 1975, at the age of 85. He is buried in the Greenlawn Cemetery, Bakersfield, California. One of the 6-inch deck guns on the Aeolus with several "Jackies" setting on the gun. Photo was taken by Stanley during 1918. Stanley Scott standing on the left end next to the soldier. 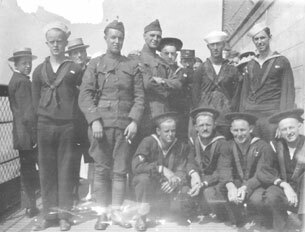 These were some of the sailors from the Aeolus and may have been taken while in port in the United States. Behind the soldiers and sailors can be seen two men in civilian clothes. Also behind the sailor standing on the right end can be seen a woman wearing a fancy hat. Photos shared by Barbara Estabrook, a relative of Stanley Scott. Clarence Shelby Kempff, a Vice-Admiral of the United States Navy was born on May 31, 1874. He was the son of another Admiral, Rear-Admiral Louis Kempff (1841-1920). The father Louis Kempff was born to Friedrich and Henrietta Kempff in Illinois and would be appointed to the United States Naval Academy on September 25, 1857 and graduated from the Academy with the class of 1862. On August 1, 1862 Louis Kempff was advanced to the rank of Lieutenant serving in the Civil War with the famous Union Admiral David Farragut who uttered the famous battle cry of "Damn the torpedoes Ð Full speed ahead!" at the Battle of Mobile Bay. Louis Kempff would rise through the ranks of the navy serving over 17 years of sea service. Among the years at sea Louis Kempff commanded a squadron during the Boxer Rebellion. One duty the then Commander Louis Kempff, held was that of Shipyard Commander at Mare Island Navy Yard, California. This would be a position that, the father, Louis (1889 and 1899-1900) and the son, Clarence (1937-38) would both hold. In 1880 Commander Louis Kempff and his wife Cornelia lived in Menlo Park, San Mateo County, California and at the time had 4 sons, Clarence, Raymond, Louis and Allen. Following in his fathers footsteps Clarence would be appointed to the United States Naval Academy on May 19, 1893. Young Clarence Kempff Graduated from the Academy and began his career as a Line Officer, which would one day take him to the rank of Vice-Admiral. Through out his naval career EBAI was his official Naval Signal call letters. In 1900 as an Ensign one of Kempff's first duties was on the USS Albatross. 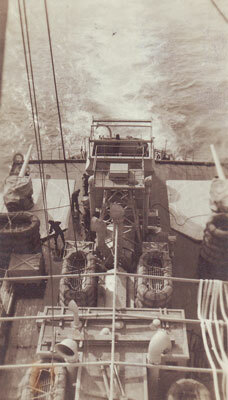 The Albatross was then a Bureau of Fisheries vessel under the Command of Lt. Cmdr. Jefferson F. Moser. Ensign Kempff's duty on the Albatross was in charge of the engineer department. 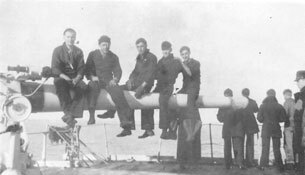 Under Moser's command on the Albatross there were 6 officers, one Lieutenant, one Lieutenant jg the ships doctor, and three Ensigns and one Ensign in Training. Two of the 6 officers Moser had under his command would one day become Admirals. Moser's Executive Officer, Lt. Hugh L. Rodman would during WWI be an Admiral and Ensign Kempff would reach the rank of Vice-Admiral at the height of his career. For two years ending in 1907 Kempff had duty in the Asiatic fleet aboard the USS Raleigh. And in mid 1907 he was detached from this duty and returned to San Francisco. Sometime in 1906 Lt. Kempff was married and his wife's name was Alice Wyer Brigham. Alice and Clarence were fortunate as his next duty was on shore and not at sea. On August 15, 1907 his duties took him back to the Naval Academy where he served for a year or so until it was time for sea duty again. Lt. Kempff was assigned to duty on the battleship USS Michigan on June 8, 1909. Kempff was then assigned to duty on the USS New Jersey, where in 1910, he was advanced to rank of Lt. Commander. After duty with the New Jersey, Lt. Cmdr. Kempff was assigned to duty in 1913, at the Mare Island Navy Yard where he served as the YardÕs Inspecting Officer. Lt. Cmdr. Kempff's next duty was at sea, where he commanded the collier USS Jupiter. The Jupiter was the first naval ship to be powered by electric motors in place of the reciprocating steam engines of the time. She was also famous for being converted into an aircraft carrier in 1920 and renamed the USS Langley. During the 1914 expedition of United States Forces into Mexico the Jupiter transported a marine detachment from San Francisco, California to Mazatlan, Mexico where she arrived on station on April 27, 1914 poised for action should they be needed in Vera Cruz, Mexico. Once relieved of this duty the Jupiter under command of Lt. Cmdr. Kempff was under orders to sail to the Philadelphia Navy Yard via the Panama Canal. Lt. Cmdr. Kempff gave orders to leave Mexican waters bound for Philadelphia on October 10, 1914. Under Kempff's command the Jupiter would be the first vessel to transit the Panama Canal from west to east. The navy was then considering using the new turbo-electric propulsion engines for use in the new battleships being built and planned. It would be Lt. Cmdr. Kempff who would test this system in the Jupiter and make recommendations to the Secretary of the Navy that would change how ships of the line would be powered in the future. On her transit through the canal the Jupiter, with her inadequately designed rudder, was able to maneuver in the tightest spots in the canal at the Culebra Cut, where there was barely 40 feet of clearance in any one direction, with great ease. Once Kempff had brought the Jupiter successfully through the canal he had her steaming up the east coast, but when she was near Cape Hatteras something was spotted in the water dead ahead of the Jupiter. Kempff had the Jupiter steaming along at 14 1/2 knots at the time the order was given to the helmsman to reverse her engines. In five seconds time the motors were reversed to full speed astern and then again to full speed ahead in the same amount of time. This was a feat that could never have been accomplished with the traditional engines of the day. Additionally on this trip it was noted that she was making an average speed of 12 knots with a displacement of 20,000 tons. She consumed 60 tons of coal daily to obtain this average speed, which was a 25% savings in coal consumption. Jupiter was built for a maximum speed of 14 knots, but at one point Kempff had her clipping along at 15 knots for a 48 hour run. Once the Jupiter put into Philadelphia, Kempff made a full report on the performance of the turbo-electric system to Secretary of the Navy Daniels. At the beginning of WWI many German passenger ships were interred in United States ports. One such ship was the Grosser Kurfurst. She was on April 6, 1917 seized by the United States Government and her German crew removed and made prisoners of war. She was one of the larger German passenger liners and she was selected by the navy department to be converted into a troop ship. Once commissioned into the United States Navy on August 4, 1917 her captain was Lt. Commander Clearance S. Kempff. 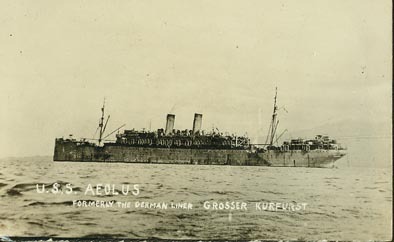 The navy changed her German name of Grosser Kurfurst to USS Aeolus. The Aeolus under the command of Captain Kempff was one of the 12 troopships in the Newport News Division under the command of Rear Admiral H. P. Jones. Once World War One ended Kempff was assigned to shore duties and was serving at the Philadelphia Navy Yard. Kempff and his wife lived at the Navy Yard with their 4 children daughter Alice W. born about 1911 in Maryland, son Clarence Jr. born about 1913 in California, daughter Katharine P. born about 1917 in Rhode Island and youngest son Charlie B. born about 1919 in Pennsylvania. On July 29 of 1920 Lt. Cmdr. Kempff was summoned to Santa Barbara, California due to the death of his father, Rear-Admiral Louis Kempff. The elder Kempff had been an invalid for several years before his death. RADM Louis Kempff body was cremated and private services were held with the family. While still serving at the Philadelphia Navy Yard in 1920, Clarence Kempff was advanced to Captain. Two years after the end of the fighting in France on November 11, 1920, the Navy Department awarded medals to several officers who had served with distinction during WWI. Captain Kempff was awarded the Distinguished Service Cross, Navy for his service during WWI. In March of 1921 Captain Kempff was again assigned sea duty this time in command of the cruiser USS Galveston, then serving in a Special Service Squadron watching over American interests in waters ranging to the Panama Canal and down the West Coast of the Central American States to Corinto, Nicaragua. Once his sea duty with the Galveston was completed Kempff in 1922 entered into the Naval War College where he served until 1923. He was then assigned duty as Captain of the Norfolk Navy Yard from January-May 1925. In early 1925 he was assigned as Commanding Officer of the USS Seattle then the Flagship of the U.S. Fleet, which was under the command of Admiral Samuel S. Robison. Captain Kempff on May 30, 1925 took passage to Honolulu, Hawaii from San Francisco, California aboard the President Cleveland where they arrived in Honolulu on June 5, 1925. Likely this was where he took command of the Seattle. Later in 1925 Kempff took the Seattle on a cruise to Australia. On June 11, 1926 Kempff relieved Captain Todd as commanding officer of the USS Nevada. Under Kempff's command on the Nevada was a young Lieutenant jg by the name of Hiram Rickover, he would later become known as the father of the nuclear navy. Kempff and Rickover became friends while serving on the Nevada. Captain Kempff was assigned duty to the NavyÕs Hydrographic Office as the Hydrographer of the Navy and was commanding officer of one of the Navy Oceanographic Research ships from September 1927 through June of 1930. After that duty he was given command of the Second Light Cruiser Division of the Scouting Force. On June 28, 1932 Kempff became commandant of the First Naval District and the Portsmouth, New York, Navy Yard serving there until May of 1934. After that he was advanced to Rear Admiral and went back to sea as the Commander of the First Battleship Division of the Battle Force. From 1937 through 1938 Rear Admiral Clarence Kempff held the position of Commandant of the Mare Island Navy Yard. This was the same position his father, Rear Admiral Louis Kempff had also held years before. On November 17, 1937 the daughter of RADM Clarence Kempff, Miss Eleanor Kempff christened the destroyer USS McCall (DD 400) at the Union Plant, Bethlehem Shipbuilding Corporation, San Francisco, California. By the end of his naval career Kempff was advanced to Vice-Admiral and was retired at the mandatory age of 62 in 1938. He and his wife Alice retired to the San Francisco, California area where he passed away on February 10, 1959 in Coronado, California. Vice-Admiral Clarence Shelby Kempff was buried in the Ft. Rosecrans National Cemetery on February 13 in Section U, Site 1819. His wife Alice lived until Veterans Day, November 11 of 1965 when she passed away. She is buried next to her husband the Vice-Admiral in Site 1818 of the Ft. Rosecrans National Cemetery. Louis Martin Fink, Sr. was born on December 27 of 1895 in Northeast Kansas in the town of Lowemont, which is not far from the Kansas and Missouri border. He was of German ancestry and he had 12 other brothers and sisters all raised on the farm there in Lowemont. The parents of Louis Fink were Peter and Mary F. (Wiesinger) Fink, Peter having been born in Germany in June of 1863 where he had come to America in 1883 settling in the Lowemont, Kansas area. There in Leavenworth County, Kickapoo Township, Peter established a farm. In 1895 Peter gained his U. S. citizenship and he and his wife Mary F. started a family, which would include 10 boys and 2 girls. (Leo, Peter Jr., Louis, Herman, Alois B., Ernest, George, Albert, Henry R., Anna M., Mary H., and Joseph J.) LouisÕs mother Mary was born in Ohio but both of her parents were German born, and she and her husband Peter raised the children in good German Catholic traditions. Anne Robertson, LouisÕs youngest daughter recalls about the fond and deep connection Louis had with his mother Mary. Anne related, "It was obvious to me that he deeply loved his mother. By the time I was born and got to know her she was quite elderly and hard of hearing, so difficult to communicate with. But he diligently made frequent trips to the same old farmstead where he grew up and his mother remained with one of her sons, Joe (Joseph) and his family (wife, Monica and a daughter and a son Jeannie and Joseph Jr). He would take her things he knew she liked, for example, little miniature bottles of Welch's grape juice, a small token of his love for her. As young as I was, and even more so in later years, it was obvious to me that he loved his mother deeply. He never mentioned his father so I can't really comment on that." Anne Robertson stated that a proper memorial to her father Louis, could not be complete with out the importance of what his mother meant and did for him to make him the man he was. In AnneÕs words, "I think it is the only thing my father would ask, that a memorial of sorts to the love and hard work (understandably with that many children) his mother endured for her children. After she passed away she was buried at the cemetery on the grounds of St. Joseph of the Valley Church and he planted roses on her grave. He was famous for his beautiful roses (he tended some at the church we attended) and as with everything he was careful to see to her roses every year on Memorial Day." Louis Martin Fink at the age of twenty-one registered for the Federal Draft in the first call up on June 5, 1917. At the time he lived on the family farm and worked for his father farming. He was single and had bluish-grey eyes and dark colored hair. Louis Fink joined the Navy at the Kansas City, Missouri recruitment office on June 11, 1918 where he was given his Service Number of 1505616. Seaman Fink was assigned to duty aboard the Former German Passenger ship Grosser Kurfurst, which had now been renamed USS Aeolus. Seaman Louis Fink made several crossing of the Atlantic both during the war and after the war. On September 22, 1919 he was released from active duty from the Navy Demobilization Station in St. Louis, Missouri. Fink stayed in the Reserves until he was given an honorable discharge from the U.S. Naval Reserve Force on September 30, 1921 as Seaman First Class from Headquarters, Ninth Naval District, Great Lakes, Illinois. After the war Louis Fink returned to his home in Lowemont and continued the family tradition of farming. On October 7, 1932 Louis Fink was admitted to the Veterans Hospital in Kansas City, MO for a hernia. On the VA Admissions records he listed his mother, Mrs. Peter Fink as the nearest relative as he was still single at the time. During his lifetime Louis Fink had many different jobs in several different cities as he and a friend moved from place to place enjoying the bachelor's life. For a while he worked as a Street Car Conductor in Los Angeles, California and he also lived in Chicago for a while. He did not get married until he was 43 years of age. Together with Helen Marie (Kroll) Fink, his wife, he had 3 children: Louis Martin Fink Jr., Helen Eileen (Fink) Peterson, and Barbara Anne (Fink) Robertson and many grandchildren and great-grandchildren. Louis Martin Fink was an honorable man who always swore allegiance to his country and to God. He was also a generous man, willing to help those in need. Louis Fink died in Leavenworth, Kansas on April 8, 1983, from lung cancer. He left a note saying that he wanted a U.S. flag on his coffin and indeed he did have one, and so he was laid to rest well as he had wanted in the Mount Calvary Cemetery, Leavenworth, Kansas. Louis Fink's youngest daughter Barbara "Anne" Robertson shared the following photos of her fathers. She also gave this remembrance of her father Louis Fink; "My father was, if nothing else, conscientious about keeping notes so I'm sure what he wrote is correct. He kept a diary of everything, even the mundane, such as when he did maintenance on our old chiming wind-up Seth Thomas clock." Anne continued with, "He was proud, but silently and never a boastful man. One of the few things I recall him being outspoken about was when he would get into light-hearted disagreements with his brothers or brothers-in-law about who had the biggest tomato which ripened the soonest in the early summer garden which he kept weed-free. He was a diligent man and had "sayings" for everything. But one that I remember the most was "Work is a man's greatest blessing." That was something I didn't really appreciate or want to hear being very young myself my mind was more on having fun." This photo is of one of the Aeolus's Port side lifeboats. Louis Fink is seated, third from the right on this photo. This view, likely taken by Seaman Louis Fink, is looking downward at the stern of the Aeolus, which shows some of the guns on deck which Louis said he personally witnessed being fired on one occasion when a German submarine was spotted nearby. However the submarine went back where it came from and everyone breathed a sigh of relief. 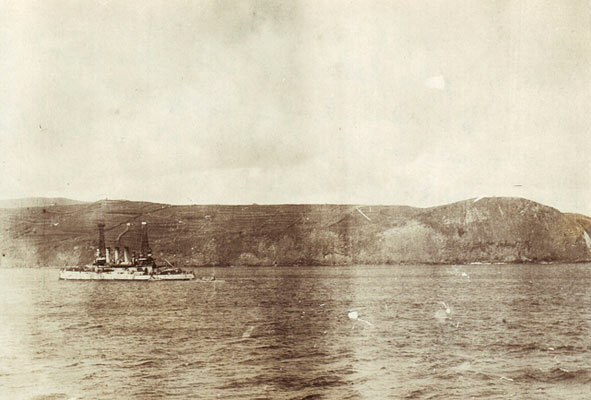 This is a view taken from the Aeolus, which is, according to Louis Fink's writing on the back of the photo, of the battleship USS Ohio when they were going through the Azores. The Aeolus had been in the Azores to coal as she was running low. Elements of the 61st Field Artillery Brigade, the 111th Ammunition Train, the main body of the 36th division, and the 111th Trench Mortar Battery had left Coetquidan, France in the latter part of February, 1919, and had been "dipped" for cooties at St. Nazaire where they were loaded aboard the transports Rijndam, the Aeolus, Kroonland, De Kalb, and the Arcadia for what, except for seasickness, proved to be an uneventful voyage to America. At least one coal-burner, the Aeolus, which carried some 1,400 men of Colonel Birkhead's 131st Artillery Regiment, stopped by the Azores for coal and water. Thomas F. Wilson was a cook aboard the USS Aeolus from June 1918 to June 1919. Wilson was Honorably Discharged from the Navy on September 30,1921 with a War Service Chevron and The Victory Medal with Clasp. John Joseph ÒJackÓ Bannister served as a Coxswain aboard the troopship USS Aeolus during WWI. In the summer of 2016 ÒJackÓ BannisterÕs grave at the Los Angles National Cemetery was visited by his grandson Jim Keifer and great-granddaughter Claire Keifer. Jim Keifer was only 2 1/2-years old when his grandfather ÒJackÓ passed away and has no recollection of him because he was too young. John Joseph ÒJackÓ Bannister was the son of Bridget Agnes Cleary (1863-1907) and William Henry Bannister (1862-1933), and was born on September 27, 1888 in Boston, Massachusetts. ÒJackÓ grew up a Boston kid and likely was around ships and the water front as a youth and as a young man. ÒJackÓ would serve in the Navy during WWI and was stationed aboard the former German liner now renamed USS Aeolus, which was being used to carry troops across the Atlantic to the battlefields in France. ÒJackÓ Bannister held the rating of Coxswain and aboard the Aeolus likely handled and piloted the several small boats the she carried on her decks. Once the war ended Coxswain Bannister was Honorably Discharged in 1919 and returned to civilian life. He returned again to the Boston area and his family. ÒJackÓ was in 1920 a 31-year old single man living in Springfield, Massachusetts. At the time he was working for the Milton Bradley Company making games and toys of all kinds. This would be a lifelong job for ÒJackÓ working for the Milton Bradley Company. He would later become a foreman at the factory. The Milton Bradley Company would become part of the Bannister family as ÒJackÓ worked nearly his entire adult life there and his grandson Jim Keifer, the man who barely knew his grandfather would also work there in the factory and later would later become a product designer for the company for many years. Later in 1920 ÒJackÓ Bannister would marry Mary Agnes McGillicuddy (1887-1981), and they would have two daughters, Christine and Grace. The Bannister family lived on Virginia Street in Springfield during the later 1930Õs. The Bannister family remained in Massachusetts for many years, but in ÒJackÓ and MaryÕs later years they moved out to California to be with one of their daughters. ÒJackÓ would pass away on November 22, 1965 and was buried in the Los Angles National Cemetery on November 26. His grave is located in Section 127, Row Y, Site 5. 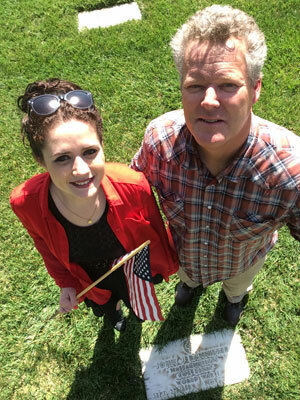 In June of 2016 grandson Jim Keifer and great-granddaughter Claire Keifer visit the grave of "Jack" Bannister at the Los Angles National Cemetery.